As we say in Turkey, HOS GELDINIZ! Welcome to Turkey. 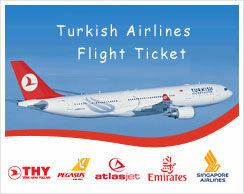 We will meet you at the airport and transfer you to your hotel. After a short briefing about your tour you will have the afternoon free to rest and explore Istanbul on your own. Overnight stay in a centrally located unique hotel. After breakfast we will continue on a full day tour of Istanbul’s main historical sites. *Haghia Sophia--1,400 year old supreme church from Byzantium times which houses famous Byzantine Mosaics *Byzantine Hippodrome--The focal point of the Byzantine Empire during the reign of Constantine. Within it’s center you will see the Egyptian Obelisk and Serpentine Column. *Topkapi Palace--the residence and leadership center of the Sultans during the Ottoman Empire. It was built in 1459-1465 shortly after the conquest of Constantinople. You will see the Treasury that includes the Topkapi Dagger, the 86 carat Spoon Maker’s Diamond, and the jewel encased bones of St. John the Baptist’s skull and arm bone. Very early in the morning we will transfer you to the domestic airport and put you on a 1 hour flight down to Izmir, after arrival we will transfer to you Ephesus and continue on the full day tour of Ephesus. *Ephesus is one of the best preserved cities from Roman times. At the time St. Paul lived in Ephesus in the 60‘s AD, it was at it’s Roman heyday with a population around 250,000. When St. Paul lived in Ephesus he would have addressed the Ephesians in the great theatre, that today impresses everyone that walks into it’s stands. Ephesus was a great ancient city and much of it has been preserved for you to see. More than any other site, you can walk the streets, stand in the great theatre, wander in the library, look towards the hill where St. Paul was put into prison, and feel that you are walking back into the time that St. Paul lived. After being here, you will read the book of Ephesians with new eyes. *The House of The Virgin Mary where it is believed St. Mary came to live with St. John in the last years of her life. After the tour we will be on our way to Pamukkale, Arrival in Pamukkale, check in the hotel, dinner provided & Overnight stay in Pamukkale. *Pammukale which means cotton castle, is the result of limestone formations built over thousands of years. Warm calcium rich mineral water flowed over the cliffs and as it cooled it deposited the calcium into the formations that are seen today. Pammukale is now a world heritage site. *Hierapolis was founded as a healing care centre in 190 BC, taking advantage of the mineral waters in the area. It was one of the most important intellectual, artistic, religious and commercial centres of the Roman Empire. It eventually had a large Jewish and Christian community. Right after the tour of Pamukkale we will put you on a comfortable overnight bus to Cappadocia. This day will be spent exploring the amazing sites of Cappadocia. *The World Heritage Site of Goreme Open-Air Museum --This is a cluster of rock cut Byzantine churches, chapels and monasteries which include some wonderful 11th and 12th century frescoes on the cave walls. This place was used by the Christians as a place of refuge from those opposed to Christianity and also was a major monastery. Rooms, churches, houses, and gathering halls have all been cut into the rock or formed from natural caves. Within the caves you can explore and see the preserved mosaics and frescoes. *Fairy Chimneys -- these geological phenomenon have been shaped over millions of years. They were formed during volcanic eruptions in the region. Reaching at times 40 meters in height, they are conical in shape and have a "hat" top to them. *Devrent Valley--This valley is know as "the pink valley" because of the color of it‘s soil. This is a lovely place to wander around and look at the magical rock formations indicative to Cappadocia, including the Fairy Chimneys. *Uchisar Castle--Also called a fortress, this is actually a formation of two gigantic rocks surrounded by smaller rocks that together form a natural fortress with towers. 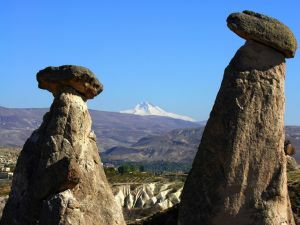 These formations were inhabited during both the Byzantine and Ottoman times. You can climb and explore the different caves and rooms throughout the fortress, experiencing first-hand what it must have been like to hide in these fortified rocks, waiting for the ancient enemy to pass by or give up. *If time allows we will also get the chance to visit local craftspeople and learn how they make dolls and create traditional pottery. *Underground City of Derinkuyu--You will gradually stroll your way down into the depths of the earth in this ancient underground city that has 18-20 floors as deep as 40 meters below the ground. Don’t worry, you will only go down to the 8th floor. Cappadocia has around 36 underground cities. Archeologists date these back to the time of the Hittites which lived 4000 years ago. Others believe they were inhabited around the 7th century BC.....Regardless of how old or young they are, undoubtedly they will leave you with a sense of awe of how the dwellers of these cities lived. You will be amazed at the elaborate ancient ventilation system in place. These cities were fortified and prepared for it’s inhabitants to hide out for months from attackers, especially during the Arab invasions. During Christian times the hiding worshippers even built little chapels that you can still see. *Traditional Anatolian villages --The head-scarfed women out at work in the fields from sun up until sun-down, and the mustached, vest-wearing men hard at work playing cards in the coffee shops. You will get time to stroll in such a village and see the average Turkish villager at work...or play. After the tour we will transfer you to Kayseri Airport and put you on 1 1 hour 15 minute flight to Istanbul, Arrival in Istanbul and transfer to your hotel, Overnight stay in Istanbul. Gule, Gule! It is time to go home. We will transfer you to the airport and wish you well, asking that you keep Turkey in your hearts and prayers, and hoping that our paths cross again in this life! If you have extended your time with an additional add-on trip, we will be confirming this day with you your additional schedule. Contact us for additional tour options.